It’s one of BC’s biggest Canada Day celebrations but it still has all the magical appeal of a small town party. With a net-full of family-friendly activities to check out, Richmond’s Steveston Salmon Festival is the place to be this July 1. Starting more than 70 years ago but always evolving with the times—a 1967 newspaper advertisement announces skydiving, a teen dance and a beauty pageant—the festival hooks more than 70,000 visitors annually. And alongside blockbuster features such as its giant street parade and massive salmon barbecue (serving 1,200 pounds of fresh-cooked fish), many extra attractions have been added to the big day over the years. 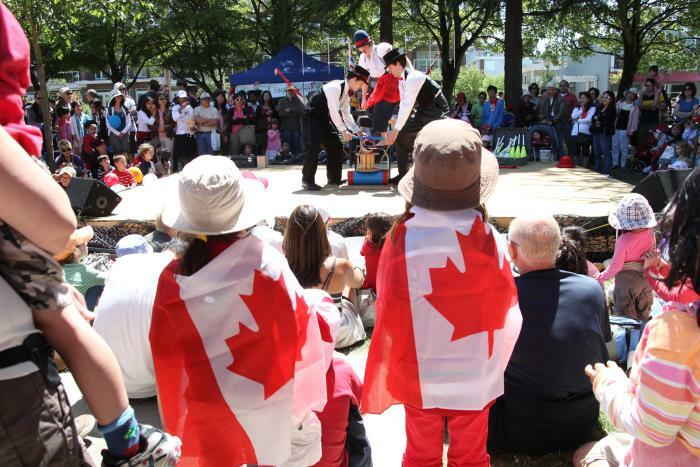 With preparations for 2018 well underway, we asked festival co-chair Kirstine Dickson for her insights—and some insider tips for those planning to visit Steveston Village for Canada Day this year. Tourism Richmond (TR): Why do you think this event is still so popular? Kirstine Dickson (KD): For those us raised in Richmond, it’s always been a fond Canada Day memory—everyone we knew spent Canada Day in Steveston! It started with the pancake breakfast in the park then everyone went to find their spot to watch the parade of floats, marching bands, sports groups and more. Much has changed since I was a kid, but the pancakes and parade are still here and the Salmon Bake and Chow Mein Booth have stayed. There is still something for every age group to enjoy! TR: What has changed over the years? KD: Recent changes include moving the stage to a less congested area across the street from the Steveston Community Centre and a much bigger emphasis on great music. We also added food trucks because we had way more people than food! We’re bringing back the Spirit of Steveston Zone that was so popular last year—it’s fully licensed with beer from Richmond brewery Fuggles & Warlock Craftworks. TR: The Salmon Bake has become a bit of a local legend hasn’t it? KD: It’s just so popular year after year! But it’s not without its challenges: we have to make sure we have enough volunteer hands on deck and enough salmon to feed everyone. 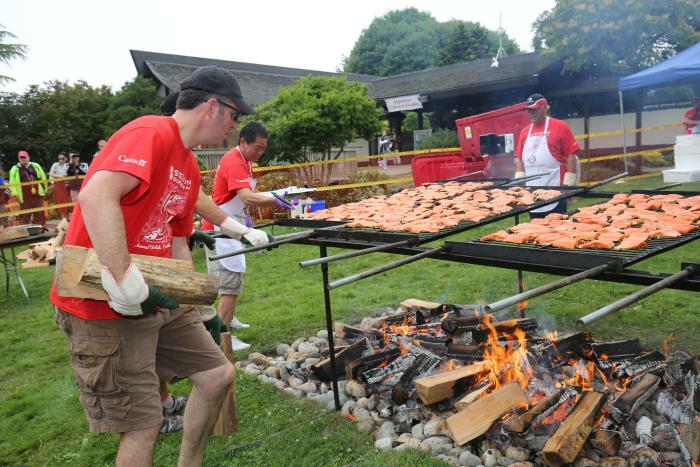 We’ve been lucky for the past few years that our salmon supplier and sponsor Canfisco has stepped up to run the barbecue—they’re very good at finding and organizing all the volunteers. TR: The parade is also huge—what’s your favourite part? KD: I really love the Children’s Bike Parade [just before the main Canada Day parade]. Just watching the smiles on the little kid’s faces is priceless—my own kids used to be part of it too. 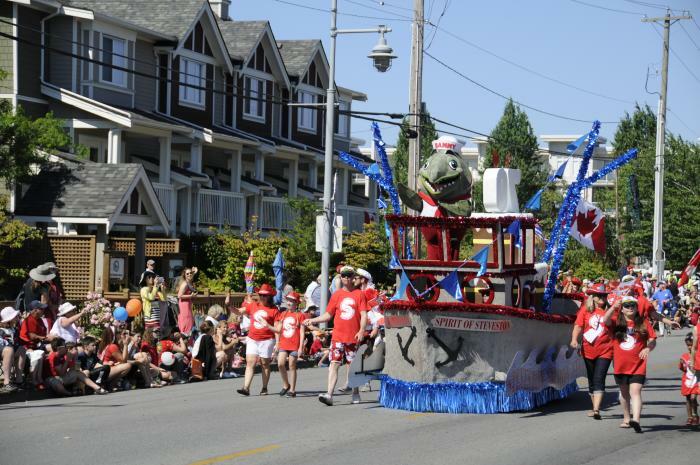 My second favourite—and yes I am a bit biased!—is our own Spirit of Steveston float that we work so hard to create every year. The kids get so excited when they see our mascot, Sammy the Salmon, at the helm of the ship! TR: What are some of the other highlights visitors should check out? KD: This year, we’ve combined all the children’s entertainment into one space in the ball diamond to the east of the Community Centre. The Car Show is also back in 2018—it’s been a very popular part of previous festivals. We also have a wonderful Pie and Ice Cream Parlour plus an Art Show and a Trade Show. TR: Do you have any final advice for visitors on how to make the most of their big Salmon Festival day out? KD: If at all possible, don’t bring your car! Anyone who has been here knows how popular this event is and how hard it is to get that many cars in and out of Steveston. We will have shuttles and a free bike valet that will hopefully alleviate some of the congestion. Once you arrive, just follow the maps and arrows and try to visit as much of the festival as you can. Oh, and come hungry—there will be lots of food! The Steveston Salmon Festival is happening in conjunction with Richmond Canada Day in Steveston.